Global microwavable foods market expected to reach approximately USD 142.44 billion by 2024, growing at a CAGR of around 5.0% between 2018 and 2024. A microwavable food requires less preparation time and it can be cooked by using a conventional microwave oven. Moreover, it comprises frozen, shelf–stable, and chilled meals such as vegetarian meals, beef, poultry, pork, soups, and frozen & chilled pizza. The report covers forecast and analysis for the microwavable foods market on a global and regional level. The study provides historic data for 2015, 2016, and 2017 along with a forecast from 2017 to 2024 based on revenue (USD Billion). The study includes drivers and restraints for the microwavable foods market along with the impact they have on the demand over the forecast period. Additionally, the report includes the study of opportunities and threats to microwavable foods market on a global level. To understand the competitive landscape in the market, an analysis of Porter’s Five Forces model for the microwavable foods market has also been included. The study encompasses a market attractiveness analysis, wherein type segments are benchmarked based on their market size, growth rate, and general attractiveness. 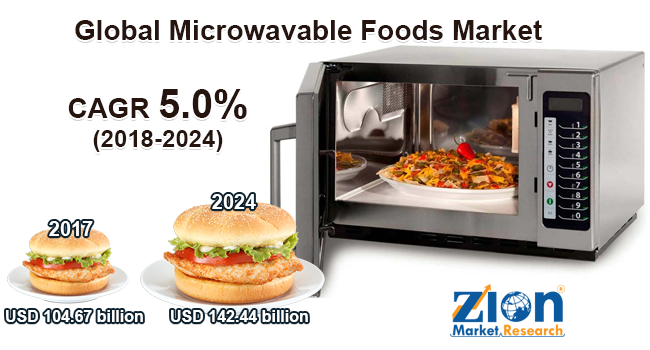 The study provides a decisive view of the microwavable foods market by segmenting the market based on type and regions. All the segments have been analyzed based on present and future trends and the market is estimated from 2018 to 2024. Based on the type, the market is segmented into chilled microwavable foods, shelf-stable microwavable foods, and frozen microwavable foods. The regional segmentation includes the current and forecast demand for North America, Europe, Asia Pacific, and Rest of World with its further bifurcation into major countries including the U.S., Germany, France, UK, China, Japan, India, and Brazil. The regional segmentation includes the current and forecast demand for North America, Europe, Asia Pacific, and Rest of World with its further bifurcation into major countries including the U.S., Germany, France, UK, China, Japan, India, and Brazil. The report also includes detailed profiles of key players such as Campbell Soup Company, Beech-Nut Nutrition Corporation, Kellogg Company, ConAgra Foods Inc., Kraft Foods Inc., McCain Foods, Pinnacle Foods Group LLC, Bellisio Foods Inc., General Mills Inc., and Nestle SA. The detailed description of players includes parameters such as company overview, financial overview, business strategies, and recent developments of the company.